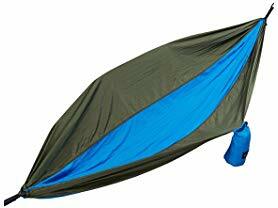 Today ONLY - Equipped Outdoors Two-Person Parachute Camping Hammock $14.99–$20.99. Equipped Outdoors hammock is a light weight hammock weighing 19oz for the small size and 27oz for the large! Perfect for camping, hiking, or any outdoor adventure! Every parachute hammock comes with an attached pouched which allows the hammock to become a compact carrying bag for easy storage. Each end has a steel carabiner clip and ropes for easy attachment to any solid object. Equipped Outdoors portable hammock can hold up to 400lbs of weight. Parachute hammocks are great for backyards, dorm rooms, or even for rugged outdoor excursions. •Durable Lightweight nylon material for easy transportation. •Attached carrying pouch makes it easy to pack, store, and travel. •Capable of holding 400lbs of weight. •Professional grade steel carabiner clips for convenient and durable attachment.